The main question that my project intends to answer is from a Critical Race Theory perspective, what role if any, Black Twitter plays in the construction and performance of identity and representation among Black London-based non-African American Twitter user? How do the research participants define Black Twitter? How do the research participants engage (if at all) with Black Twitter? I will be conducting face-to-face interviews with 30 or so individuals between now and 11th July 2014. I will also be undertaking a digital ethnographical study of participant tweets and twitter biographies. 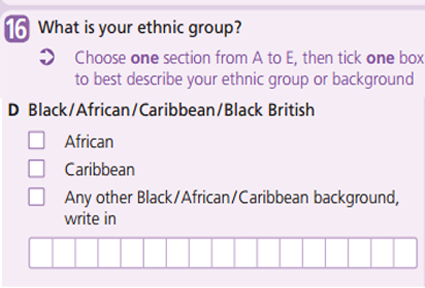 Self-identify as Black in accordance with the classification provided by the UK 2011 Census. This classification includes those who self-identify as “Black/African/Caribbean/Black British or Any other Black/African/Caribbean background” (ONS, 2011). I am very excited about this stage and I can’t wait to start learning more about race, Twitter and identity. If you are interested in taking part and/or know anyone who would be interested in taking part then please either leave a comment below (be sure include your email) or drop me an email. My dissertation proposal has finally been submitted, supervisor and advisor allocated and now just waiting for feedback – so of course I expect some of the things I post below to change but so far this is what I am working with. My working title is “Black Twitter” – A Critical Race Approach to Exploring Race and Racism Online. Why Black Twitter/Where is White Twitter? : By framing Twitter as a racialised/White place I am interested in the the origin, evolution of Black Twitter and what its continued use as a marker of an online racialised space, especially given the ‘absence’ of a named “White Twitter”, reveals about race and racism online. Black Twitter Membership: Unlike other social networking sites where one’s personal profile is the focus of interaction – on Twitter it is one’s tweets (i.e. the content of their Twitter message) that is central to the interaction. In essence what is said, and possibly even how it is said on Twitter is (supposedly) considered more important than who said it. I want to understand how the relationship between the ‘what’ and the ‘who’ of tweets impacts Black Twitter inclusion and exclusion. Is every black person on Twitter a member of Black Twitter by virtue of being black and on Twitter? Or is Black Twitter only for those who Tweet using ‘Black Tags’, and if so can a White person tweet within the space of Black Twitter? Universal Notion of Blackness? Given the global nature of Twitter and the fact that the term Black exists both as a racial descriptor and a political term; I want to explore the perspectives of non-African-American Black Twitter users on Black Twitter. And my theoretical framework, is of course Critical Race Theory (CRT) – especially three of CRT’s key elements: critiquing the notion of colour-blindness, essentialism, and counter-storytelling. Methodology: I am certainly a more qualitative than quantitative person and while I am not 100% of my methodology I would like to conduct in-depth twitter users who self identify as African, African-American, Black-African, Black-British, or Black-Caribbean. There will also be Twitter analysis, tracking trending topics and hashtags and possibly even some statistics. Who knows where the feedback I receive will take me…but that is where I am at right now. Focusing my MSc research: Race, Racism and Black Twitter? When I started this blog it seemed like the dissertation planning process was years away. Now I am a month away from submitting my first proposal. “Just” 1,000 words and a brief outline of what I intend to research and why I want to research it. I no longer have the luxury of focusing on three very broad topics: race, technology and development. I have to narrow this down to something that can be researched in a few months and converted into a 12,000 – 15,000 dissertation. This is also means that I can’t afford to simply post links to articles, journals etc without engaging with the material – something I was reluctant to do a few months ago because I felt that my ideas still needed some refining. Well, the time has come for me to do more than just read and focus my research around a topic or (at this stage) themes that I can transform into a dissertation proposal. Daniel’s not only identifies an under-researched area of Internet Studies but also suggests that perhaps an alternative theoretical framework be used to improve understanding on race/racism and Internet Studies. I had already given some thought on how Critical Race Theory could work as a potential theoretical approach but Daniel’s paper really got me thinking more about Twitter and specifically Black Twitter. 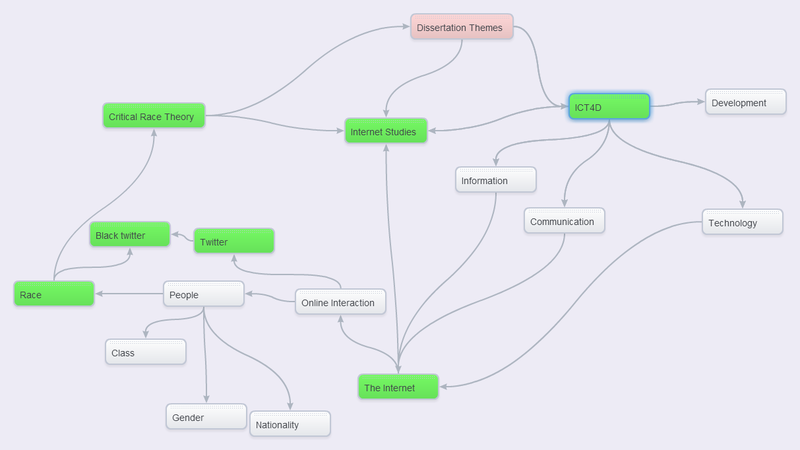 It is still early days in the process and as the mind map illustrates – those items in green; Internet Studies, Race, Twitter, Black Twitter, Critical Race Theory; are the sort of broad areas of interest to me but I am certainly becoming more focused in my reading and questioning. One area that I think I would like to explore is the potentially US-centric nature of the term Black Twitter and how it impacts non-American black twitter users. No doubt there will be other areas of interest and I will certainly be using this blog to examine these other areas. I anticipate that as a result of this (slightly) more focused approach, this blog will become less about general ICT4D and race topics and more about the construction and performance of blackness in the Twitterverse.